Greetings, dear readers! I hope you've been having a wonderful week! It's been a busy one around here with my husband out of town, but I'm taking advantage of nap time to get today's post published. Since I've got limited time to write, I'm going to keep the chit chat short and jump in on today's post. 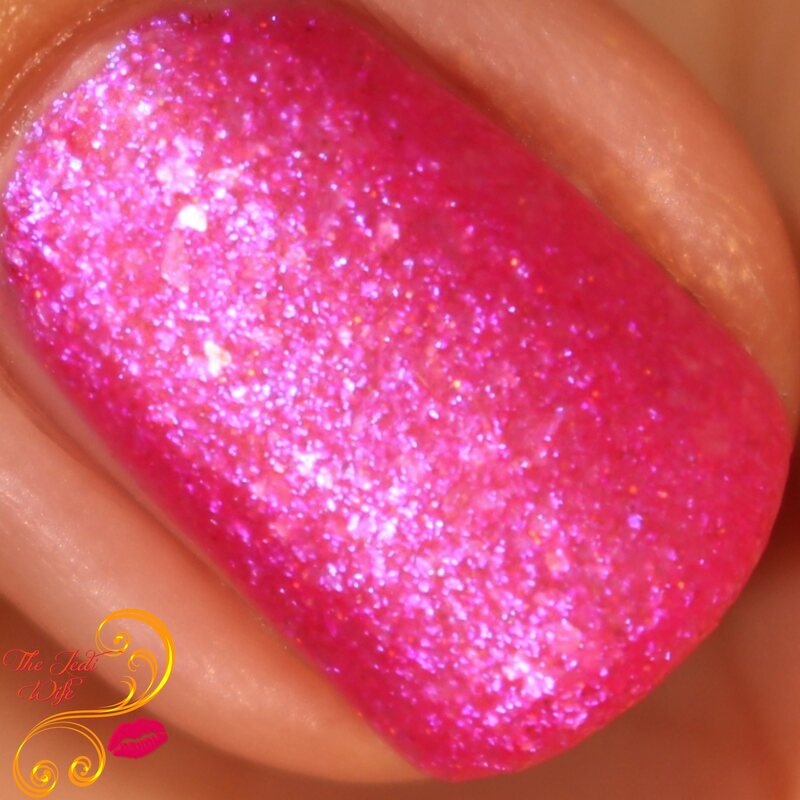 The theme for the February Polish Pickup is Sugar Rush, and sneak peeks have been going up in the Facebook group. The brands have really delivered some stunning creations, and for today's blog post, I have the pleasure of sharing one of them with you! LynBDesigns took a fun spin on the theme and was inspired by Sweet n Low. Here is a look at Saccharin Breeze! Saccharin Breeze is a bright watermelon jelly nail polish loaded with pink to purple to blue shimmer, blue glass flecks, and copper colored micro holographic glitters. This polish is sure to shoo away any winter blues you might have! The colour is so bright and cheery, and it will have you ready for pool lounging during spring break! In spite of being loaded up with all the sparkled goodness, the application of Saccharin Breeze was, well, a breeze! Not too thick or thin, it applied easily for me without any issues. I ended up using two coats to cover any visible nail line, although those with longer nails most likely will need to use a third coat for opacity. I also added a glossy top coat for these photos. I was really curious to see what Saccharin Breeze would look like with a matte finish, and I thought I'd try it out! Here is a look at Saccharin Breeze with matte top coat. I just adore this with a matte finish! You can really appreciate all that is going on with this polish, and the blue just seems to pop so much more with a matte finish! Saccarin Breeze will be available for purchase from the Polish Pickup website from Friday, February 2nd through Monday, February 5th. This is the only time this polish can be purchased, so if you want to add this beauty to your collection, be sure to mark it on your calendars! It will retail for $12 per bottle, and there is no cap in place on how many can be ordered of this particular shade. Note that all purchases through Polish Pickup is a pre-order; please allow three weeks for shipping. What do you think about Saccharin Breeze? Do you prefer it shiny or with a matte top coat? I'd love to hear from you! Ooh! This one is pretty! I love it in matte too! Bright fun pink and flakie! Gorgeous swatch! Such a pretty spring shade. It's great to buy in the Feb PPU since it'll come just in time. Oh wow, I would wear that pink in a heartbeat! Love a nice hot pink! It's perfect for Valentine's Day, and just any other day of the year haha! You had me at "watermelon jelly"! What a perfect summer shade, or why wait: Valentine's Day! Beautiful swatches! I really do love it with matte top coat. This shade is so pretty in pink! This is just a gorgeous pink! Plus looks good both ways! I might need this. Its so bright. Hahahah I love the inspiration but even more, this is amazing matte!! I really like it matte - I'm a big user (abuser?) of Sweet N Low... I always drink it with my tea. The Matte topper really shows all the flakies! Oh wow, the matte really brings out those flakes! That matte finish really kicked it up for me! Looks fantastic. Such a peppy pink color. I like the matt version too! Yeah, I'm gonna have to get this.